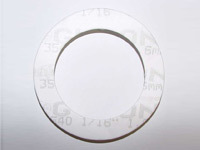 Garlock GYLON 3540 Microcellular PTFE. A high performance gasket sheet of highly compressible microcellular PTFE that seals under low bolt loads. Suitable for many non-metallic flanges. *For flat face flanges, a minimum compressive stress of 1,500psi is recommended on the contacted gasket area for 150psig liquid service. Consult with the flange manufacturer to confirm that adequate compressive stress is available.